Dan Smyers (born August 16, 1987) was raised in Wexford, Pennsylvania, where he attended North Allegheny Senior High School. He attended Carnegie Mellon University to study Finance. James Shay Mooney (born December 27, 1991) was raised in Natural Dam, Arkansas, where he attended Union Christian Academy (Fort Smith, Arkansas). Following high school, Shay attended Valley Forge Christian College for one year before completely pursuing his music career. December 2011 to Early 2013, Shay was in a relationship with country-pop singer Veronica Ballestrini. During their relationship they would post cover and original songs to Youtube and generated over 100,000 video views combined. Shay is the subject to Ballestrini's song "Death Of Me" and sings background vocals on the recording. The two met in Nashville, Tennessee on December 7, 2012, and started writing the day after they met. The first song they ever wrote together got put on hold for Rascal Flatts. Within two months the duo had multiple publishing offers and signed with Warner/Chappell Music. On October 14, 2013, the debut single "19 You + Me" was added to country radio. Dan + Shay wrote the song with Danny Orton. The song received a positive review at Taste of Country which praised the "warm details" and "emotion". Their debut album Where It All Began was released on April 1, 2014, which Orton produced with Scott Hendricks. "Show You Off" was released to country radio on May 12, 2014, as the album's second single. The duo performed on The Ellen Show performing 19 you + me in 2014 The duo made their Grand Ole Opry debut February 1, 2014. They also received a 2014 Academy of Country Music Awards Vocal Duo of the Year nomination. Dan + Shay was the opening act for Hunter Hayes on his We're Not Invisible Tour, which began in March 2014. 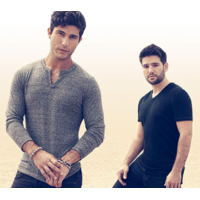 Dan + Shay opened up for Blake Shelton on the 2014 leg of his Ten Times Crazier Tour. The tour began in June 2014 and ended in October of 2014. Following the end of the Ten Times Crazier Tour, Dan + Shay embarked on their own 12-date headlining tour, entitled the "Where It All Began Tour." The tour began on October 9, 2014 in Minneapolis and concluded in Columbus, Ohio on October 26, 2014. After the conclusion of the "Where It All Began Tour," Dan + Shay set out on the road once more with Hunter Hayes on his Tattoo (Your Name) Tour. Their song 'Stop Drop + Roll' was featured on the Nashville season two episode, 'Your Good Girl's Gonna Go Bad'.